Visually impaired people are being invited to see if they are eligible for a free specially adapted radio from a charity. British Wireless for the Blind Fund (BWBF) provides the equipment to those with sight loss across the UK who meet its criteria. Radio is a lifeline to those who are blind and partially sighted, providing companionship and helping them to keep in touch with what is going on in the world, as well as the local community. BWBF offers equipment free of charge to those who have sight loss and are in receipt of a means-tested benefit. BWBF is launching its ‘Reaching Out’ campaign to try and increase awareness about their equipment and help more people who are blind or partially sighted. If you or someone you know is interested in a BWBF radio please contact Sophie Wheldon atsophie@blind.org.uk or phone 01283 790 208 or 07540 724063. It took little more than a week to transform one of Ewell’s oldest Inns into the kind of friendly restaurant and bar that you can enjoy with all the family. On Saturday 3rd November, The Spring Tavern, which dates back to the 1800’s, opened its newly refurbished doors to reveal a welcoming, warm wood and brickwork interior with décor that embraces tradition with a comfortably modern twist. 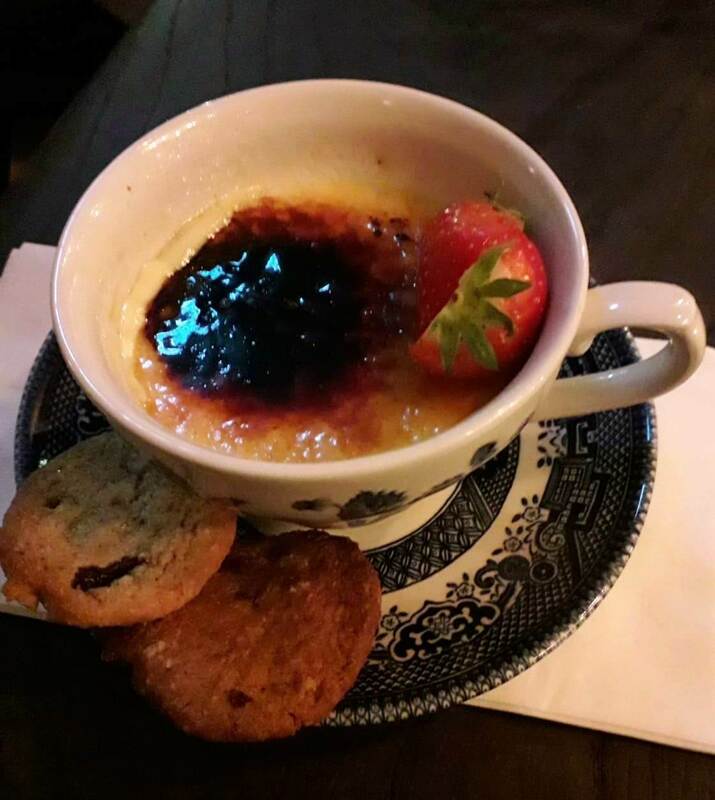 With the real log fires, very comfy armchairs in cosy corners and a mouth-watering menu to suit all tastes, they’ve thought of everything from traditional to Vegan fare and desserts in a tea cup. Manager Alex Oliveira is delighted with the new style and very proud of his team, however he told EETN that prior to the refurbishment, he held a special last-minute auction of the Spring’s old fixtures and fittings, which otherwise would have been discarded. ‘I couldn’t let that happen,’ he said, ‘there were so many lovely things to treasure including special paintings by local artists and beautiful mirrors.’ The auction raised in excess of four thousand pounds, which Alex then kindly donated to the Royal Marsden. Not everything was sold, though, and so in the New Year, he plans to hold a second auction to raise funds for a charity of his choice. What a great idea. It’s that time of year once again, when here at EETN we gather together our flyers, leaflets and notice boards, our memory sticks and boom boxes, put on our green and white tabards and make our annual foray into the Ashley Centre. 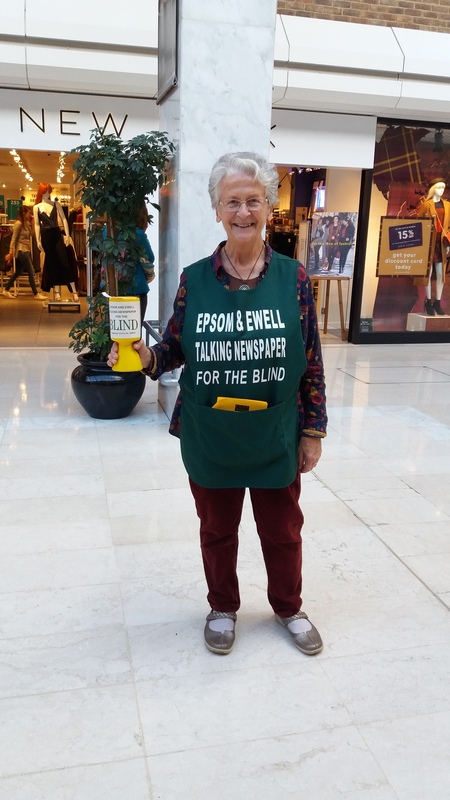 EETN Awareness Day, once again organised by volunteer Heather Griffin, gives us the opportunity to meet dozens of shoppers and passers-by, enabling us to spread the word about our free news and magazine service for blind and partially sighted people. As Heather and volunteer Richard Wheeler made their way to the Ashley Centre, laden with all that makes a good presentation desk, a team of volunteers was preparing to record the week’s newspaper. When recording had finished, some of the team, including Geoff Trickey, Gabrielle Richardson and Julie Harvey, then came on to help in the Ashley Centre. We met some lovely people as always, including young Mums and Grandparents, some of whom were interested in telling friends and relatives about our service and others are considering joining our team, which is wonderful news! We made a connection with a professional DJ and radio broadcaster and also with a local presenter from Epsom Hospital Radio. The good news is that we hope to arrange an interview with them, which will be of benefit to both EETN listeners and those at Epsom Hospital. 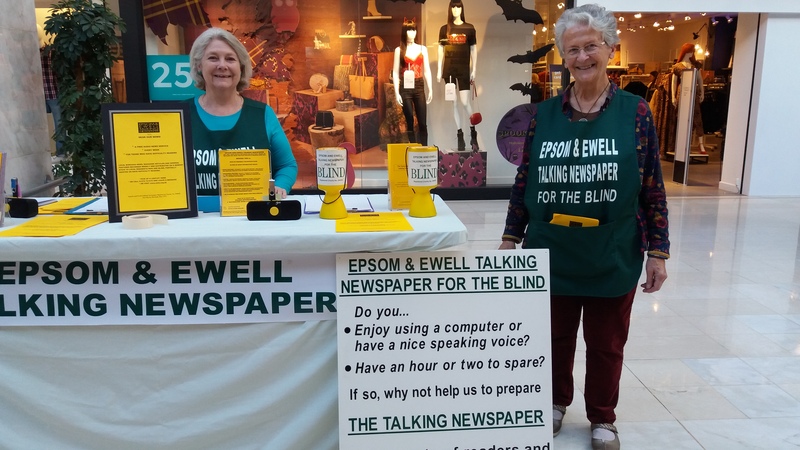 We’d like to thank everyone who showed interest in our work and will help to spread the word, and of course, to those who kindly made a donation to help keep the spoken words of Epsom and Ewell Talking Newspaper ticking along as it has done since 1975.